Here's a cool picture of two of the teams riding Merckx frames in 1986 -- Kelme and Panasonic. From Winning magazine, June 1994. It was one of two pictures meant to illustrate the ever interesting topic of shoes in the peloton. I'll post the matching picture, which shows the 1994 peloton and their shoes (and another pair of Merckx teams) shortly. Enjoy! Its no secret that I have an unhealthy love of quirky, late 80's/early 90's bike stuff. In my drive to corner the market in obsolete shifters, I've amassed a pretty scary amount of Campy Syncro equipment. Shifters, unlike frames, are small and easily hidden from the prying eyes of those who'd question my strange obsession. Good thing too. 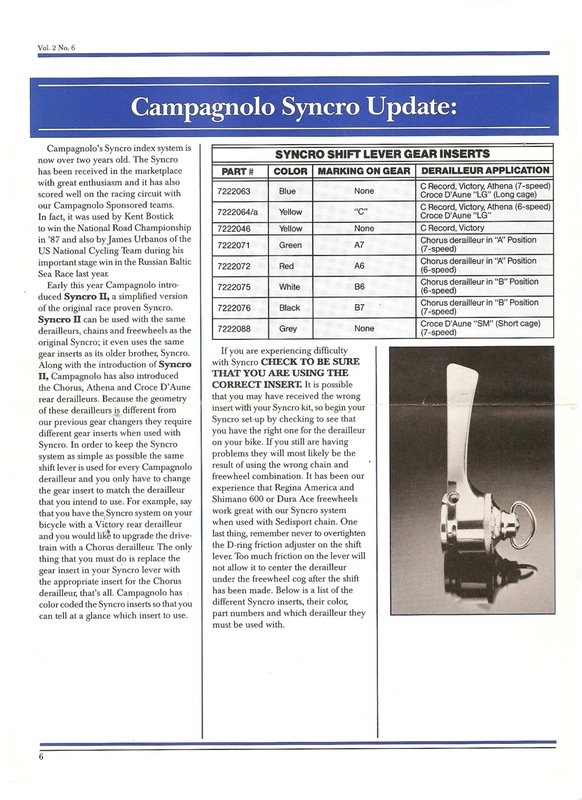 I recently came across a Syncro article in the Summer 1988 Record News, a news letter put out by Campagnolo USA in the 80's. Some interesting information in there. It confirmed the existence of 2 yellow insert variants, and maybe gave a little more clarity on what inserts work with what. Maybe. Still no listing for the Croce d'Aune small cage with 6 speeds that makes any sense. Good job guys! Here's a little pictorial of the Syncro inserts. The white "B6" insert. Sorry about the plastic. Thats all of the 6/7 speed inserts, except the grey "7V" one thats used for Croce d'Aune in 7 speed. That seems to be the only one thats ridiculously hard to find. If you have one, you really ought to send it to me - I promise to give it a good home. The yellow inserts are pretty close to being the same, except for a very subtle difference in the 5th gear, and a more pronounced one in the sixth. I suspect the differences become more apparent in freewheels that aren't tight-ratio'd. I have a pretty nice collection of team jerseys, if I do say so. A few (ok, 5) of them are various Merckx sponsored team jerseys. One of them is newly acquired, and is an interesting one to me, at least. The above is the normal, common Eddy Merckx jersey. I thought this was the design used in 1985 + 1986 Eddy Merckx sponsored teams (scroll down a little), which I'm pretty sure were cyclocross only. Most sites have 2 teams listed -- one being a Belgian team, notable for having Roger De Vlaeminck in the very end of his career, and the other being a Luxembourg team, which seems to have been an amateur team. The above isn't an exact jersey, but its pretty close. The rainbow colors aren't quite the same, but the Eddy Merckx lettering is the same -- seems like a general consumer version of a team jersey. Ok, great, makes perfect sense. The skyline on the back of the jersey seems to be Brussels -- the tallest building sort of looking like the Grand Place. The little seal which seems to depict St. Michael stomping on a dragon works too, being part of the seal of Brussels. No clue what city's skyline this is. A very boxy city, with a building that looks little like a syringe (whats with the weird lightning, glow worm thing? ), and one that looks like the Empire State building. What is this jersey? The proper 85/86 Merckx team jersey? Some small club or shop team? One of the myriad of Belgian trade teams? What skyline is that? Is anybody out there? Help!